The lakes around my house have been low this summer, so sailing has been a bit of a no-go. The weeds are so close to the surface that my lee boards get caught up and stop me dead in the water. So I haven’t gone out very often, since solo paddling my canoe is something one should only do when there’s no wind. An 18′ touring canoe is nearly a sailboat even without the sail. Which made me think, what about rowing? 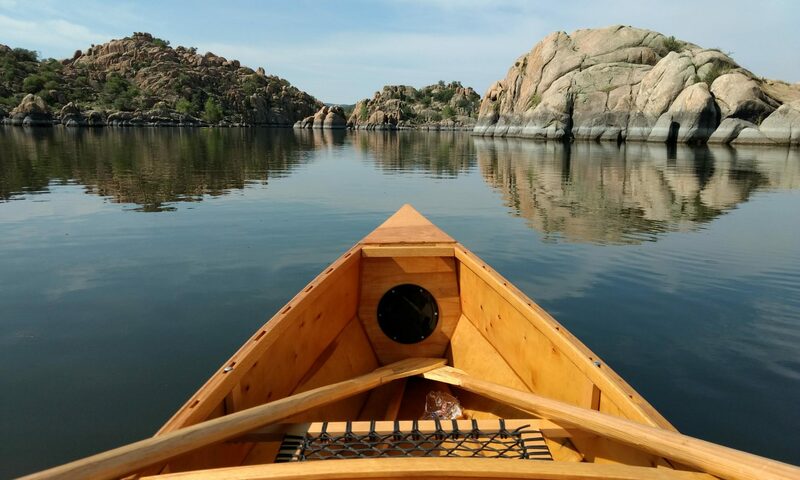 The boat is plenty big enough to sit in rowing position and at 3′ wide in the center there’s just enough room for a small set of oars without using some sort of extension bracket. The test kabe. Those bolts are way too long, but that’s all I had on hand. 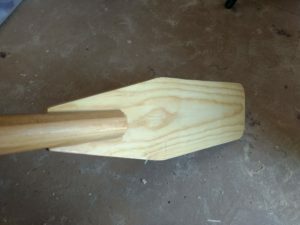 I googled rowing setups for a few hours and finally settled upon using a “kabe”, which is basically a wooden block against which the oar is pulled. The oar is usually loosely looped to the kabe to keep it in place while you pull the paddle out of the water and forward again. I went this route for two reasons. First, nearly everything on my boat that can be made out of wood (and by me) has been. Second, I didn’t really want to spend over a hundred dollars on oars and some sort of oar lock setup. So far I’ve made everything out of scrap/free wood and leftover supplies. As a bonus, I get to make it! The oar handle. 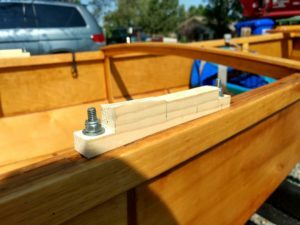 The square shape adds a little weight to the inboard end and keeps the paddle oriented properly in the water. The screw keeps the oar from sliding out of the rope that loops around the kabe to hold it in place. I plan on upgrading it to a small block of wood so it’s a little less tacky looking. The oars I made out of 2×2 stock I had gotten from a friend who’d moved and didn’t have a place to store it. I used my table saw to cut the corners off, making most of it octagonal, then an orbital sander to take most of the edges off. It’s not perfectly round, but that’s OK for my purposes. 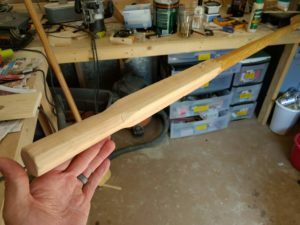 The only reason I shaped it at all was to take some of the weight off the out-board end of the oar. The in-board end I left square except for the handle. That helps balance it a bit more since it doesn’t pivot in the center, but more towards the in-board side. In actuality I probably only transferred a few ounces inboard, but every little bit helps. Oar paddle end. 1x pine shaped and fitted into a slot in the end of the 2x handle. Using a scroll saw (another gift from the moving friend), I cut a notch out of the end of the pole and slid in a paddle I’d shaped from a piece of 1×6. A little wood glue, some filler and a few coats of varnish on the wet end and I had an oar that should work well enough. 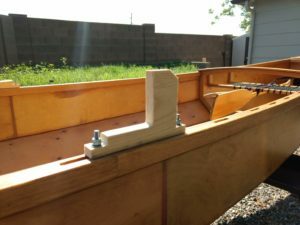 The kabe I shaped out of 1x pine and bolted to the side of the canoe. The square part of the oar is the part that sits against the kabe and this means that the paddle is always sitting at the correct angle. For this test piece I used a 90° just because I needed to get going, but the vertical face should probably be angled 6° degrees towards the back of the boat. I think. I probably need to research that more before I make my final version. Oops! I got a little carried away rowing and snapped the kabe right off! Guess a little more engineering is in order. On my first test row, the kabes and oars worked perfectly! I got my canoe moving at a pretty quick clip, at least as fast as I usually get sailing. It felt good. But it only lasted about 6 minutes before one of the soft pine kabes shear clean off. I figured that might happen, but I got what I needed from the test versions and will be making something stronger for my next round. Kabe v2 will be birch, a much stronger hardwood (and something I’ve got sitting around the shed). I’ll probably make it a little wider too. I’m tempted to put some fiberglass on the side to reinforce it a bit more, but I’ll probably just see how the birch does first. I’ve got enough extra to make a version three if need be.